The views don't quit at the gourmet oceanfront restaurant. Make room for your whole crew and gaze out over the lush hillside and blue sea. Being this high up certainly has its advantages. Look out over both the pool and ocean from your poolside perch. Polished stone floors and carved wood furnishings give your residence an urban tropical feel. Hit every sun deck as you lounger-hop your way around the resort. Order a fancy seafood cocktail or keep it casual with a burger at the poolside La Terraza. 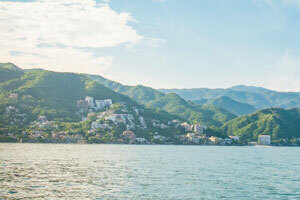 Don't miss the buzzin El Malecon Boardwalk along the oceanfront in downtown Puerto Vallarta. With an enviable address in the posh Conchas Chinas neighborhood south of the Malecon, Grand Miramar All Luxury Suites & Residences is perched high above the beach, giving you unparalleled views across the entire glorious shoreline. The aptly-named Miramar translates to “sea view” and wholeheartedly delivers on that promise, offering jaw-dropping vistas from multiple sun decks and terrace dining tables. Each spacious suite and villa is expertly styled with artisan-crafted custom furnishings, tropical hardwoods, marble and granite. Pack fancy, you’ll want to dress the part when you dine out at the gourmet restaurant overlooking the glimmering water. The onsite spa beckons, with a full treatment menu including imported, completely homogenous moor mud from Tiefenmoor de Vorarlberg in Austria. Pool-hop your way around all three pools and jacuzzis. Hit the beach club. Or enjoy exclusive access to one of Mexico’s swankiest golf clubs (transportation provided). All-inclusive room rates at Grand Miramar All Luxury Suites & Residences are available. These rates are higher because they include onsite food and beverages in the room rate (some restrictions may apply).